Yeah, but: They're not the most powerful, but they last. 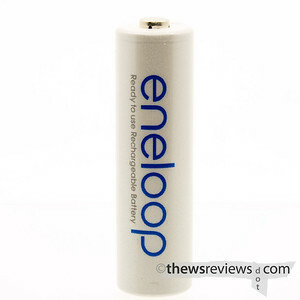 The Long Version: Sanyo's Eneloops batteries are one of a new type of low-discharge rechargeable battery. According to the Wikipedia entry, there are now five different manufacturers making these cells, and they're marketed under twenty different names. I have no information about whether they perform the same, or if they're getting different ends of the quality curve. Either seems perfectly plausible, and I have no experience with the other names. Stefan has already done extensive testing on these batteries, so I'd hate to make all of his ads and referral links go to waste. All I can really add is that potential buyers shouldn't be put off by their lower mAh rating. The flashes that I've used with them happily recycle and fire just fine, but with the added benefit of doing it after sitting in a drawer for a month or more. Because the self-discharge rate is so low, these batteries have enough 'shelf life' to serve in electronics that normal NIMH or NICAD cells fall flat in. Remotes, clocks, backup flashlights, Powershot A-series cameras, and other items that have low drain or infrequent use are perfect for these bad boys. It's possible to become a disposable-battery free household, saving some environmental impact. Only you can decide if the added cost and effort is worth it. Yeah, but they're the prettiest batteries ever! I've recently added a few sets of Duracell and Panasonic batteries that use the same technology. I haven't had any complaints with the Eneloops, but I just haven't been able to find them very easily. But I still like the Eneloops the best.